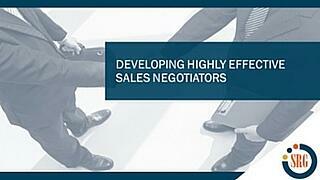 In order to reach successful outcomes with today’s sophisticated and knowledgeable buyers, today’s sales professionals must now be master negotiators. That means excelling at challenging negotiation situations, whether it’s agreeing on the value of tradeable issues, managing buyers that ask for last minute concessions, or preventing discounting. In this webinar we share best practices and strategies that you can use to empower your sales team to skillfully sell and negotiate the total value of your solution and minimizing discounting.